Xerox conducted a survey about the usage of EHR software, particularly patient portals, across the country. We thought that some of the statistics were very insightful and we wanted to share these numbers with you. After all, your business thrives on helping improve your patients' health and keeping them satisfied. Read on to see what an online patient portal can do for both your practice and your patients. Are Patient Portals Beneficial to ECPs? 59 percent of respondents who already use a patient portal say they have been much more interested and proactive in their personal healthcare since they received access. And more than half of those who don’t use portals (57 percent) say they would be much more interested and proactive in their personal healthcare if they had online access to their medical records. This shows that there’s not only demand from your patients for a patient portal, but it also works in engaging your current patients. That’s one way to increase patient retention! Patient portals allow you to communicate with your patients, give patients access to their medical records, help with scheduling, eliminate paperwork, and educate your patients about their diagnosis and assessments. A patient portal not only helps your patients, but your practice too. Some can be purchased as a separate solution, if you are still a paper practice moving to electronic records, but some already come as part of a practice management and EHR solution. Stage 1: More than 50 percent of all unique patients seen by the ECP during the EHR reporting period are provided timely (within 4 business days after the information is available to the ECP) online access to their health information subject to the ECP's discretion to withhold certain information. Stage 2: More than 50 percent of all unique patients seen by the ECP during the EHR reporting period are provided timely online access to their health information. Stage 3: More than 50 percent of all unique patients seen by the ECP during the EHR reporting period (or their authorized representatives) view, download, or transmit to a third party their health information. So, you’re sold on the idea of a patient portal. Or maybe you already have one, what’s next? Among those who do not use patient portals, 35 percent did not know a portal was available and 31 percent said their physician had never spoken to them about portals. Communicate benefits: You won’t have to come up with an entire presentation, but a short brochure or even a one-page print out detailing the patient portal will be helpful in educating your patients. Have the receptionist include the print out during check in. The OD should also reiterate the benefits during the patient visit, such as the ability to send digital information about their assessment through a patient portal and shorter appointments. You can also offer your patients to sign up for an account via a tablet as they are filling out other paperwork in the office. This may seem a little time consuming at first, but when most of your patients have converted to using the portal, they will be able to save time on pre-arrival paperwork. Utilize social media: The survey also shows that millennials are more likely to report the highest preference in accessing patient portals on the go. With a high demand for a patient portal among younger patients, social media is a good outlet to promote the use of your patient portal. Share instructions on how to get registered and remind them of the value of it. This will also help encourage those who are not yet onboard with the idea of using one. You can even share educational materials such as videos on how to treat a common issue that your practice has been seeing a lot off. Uprise is a cloud-based practice management solution that comes with a patient portal already built in at no extra cost. 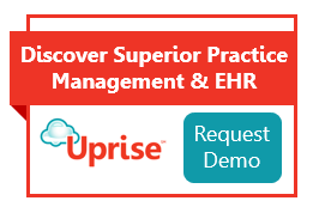 Request a free demo to learn more about how your practice can seamlessly switch to Uprise.